MariFlex has designed easy to use hose reels. 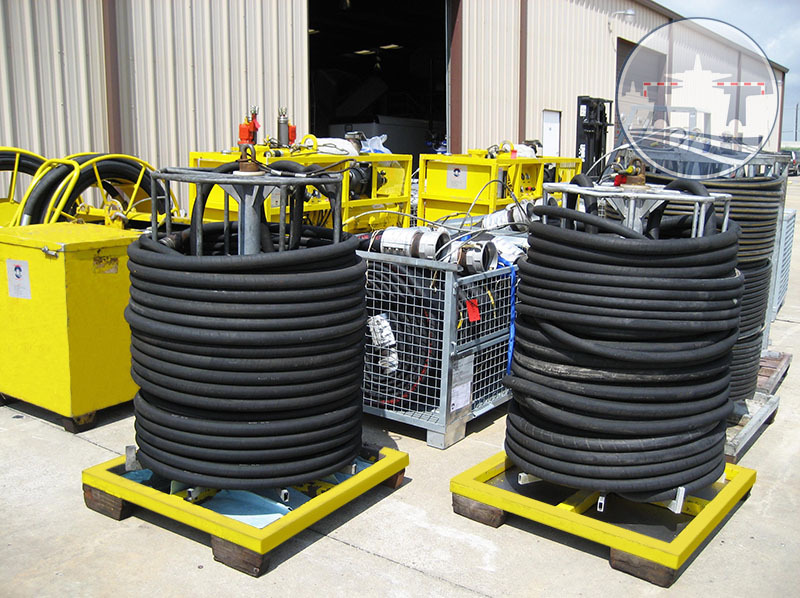 This enables you to organize your hydraulic hoses to organize and store them in a safe and easy way. The hose reels can accommodate either 3 sets of 18 mtr hydraulic pressure (1”) and hydraulic return (1½”) hoses or 3 sets of 32 mtr hydraulic pressure (3/4”) and hydraulic return (3/4”) hoses. MariFlex made Special Storage and Transport reel for hydraulic hoses to overcome the physical hose handling problems inhereant with relative heavy an stiff inflexible hydraulic hoses. – 3 x 18 mtr 1 inch high pressure hose. – 3 x 18 mtr 1 1/2 inch return hose. – 6 x 32 mtr ¾ inch high pressure hose. Please note that all hoses are provided with Snap-tite quick couplings. Dimensions : L = 100 cm x W = 100 cm x H = 154 cm. Total weight : with 3 sets hoses 334 kilos. with 6 x 32 mtr hoses 300 kilos.